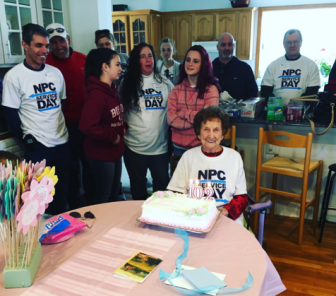 This past Sunday, April 3, hundreds of members of Noroton Presbyterian Church (NPC) participated in 25 community service projects around Darien for the first annual NPC Service Day. The idea was for the church community to come together, all ages and stages, and serve their greater community. “NPC Service Day was really a chance for our congregation to give back to our community through service. It was beautiful to see young and old having fun and serving our neighbors together,” said senior pastor, Samuel Schreiner. The day was a year in the making with projects for everyone, i.e. outside projects, sitting down projects, manual labor projects, etc. The idea was to have a wide variety of one to three hour shifts so that each member could sign up for one or more, either as a family or individually. NPC also served some of their mission partners, such as a group doing yard work up at Pivot Ministries in Bridgeport, writing letters to our mission partners, knitting baby blankets for Hopeline Pregnancy Resource Center, serving a meal at the Open Doors Shelter and many more. The projects included: making and bringing baked goods to the fire and police departments and Post 53, partnering with the Darien Land Trust and cleaning up Woodland Park, bringing our children’s choir to sing for the residents of Maplewood, passing out hot cocoa on the sports fields, cleaning up some of elderly members’ yards, visiting homebound members, praying for our community and nation, among other things. The day started with a service at 8 a.m. followed by a commissioning and then individuals and families headed out to their projects. The volunteers returned at 5 p.m. for a service of celebration and a time for fellowship. “It was wonderful being a part of a day where instead of going to church we were all being “the church” – the sense of joy and grace that filled the day was a huge answer to our hopes and prayers,” said Stella Clarke, Director of Missions. Noroton Presbyterian Church hopes to continue this event next year with the second annual NPC Service Day. For more information visit the church’s website.